Q is a community – a critical mass of people who are all working, in many different ways, to improve health and care in the UK. The aim is to support continuous and sustainable improvement. Q is bold in scale, and simple in aim. We’re seeking to make it easier for people to share, learn and collaborate across boundaries because we think this is key to making a bigger difference for those we serve. How? If you were to look at our theory of change the language we use is around enabling people to connect, develop, mobilise and support each other. While we know there is a lot of great improvement work happening at a local level, often it is limited to a professional group, location or time-restricted project. Q is creating opportunities to expand on this at scale, in real time, embedded within the system and spanning beyond a single location or group. Q is unique in many ways. However one of the things that make it particularly appealing is the way it was created. We knew it needed to be designed by those who would use it so it would evolve in a way that complements what already exists, be genuinely useful and feel owned by the members. In 2015 we recruited 231 colleagues from across the UK to help design Q. This included 12 people who brought experience and insights from the Scottish system. What is it members do once they are in the community? There is no minimum time commitment, and we have designed a range of online and face-to-face ways to connect that fit with peoples’ busy lives. Like with many things – the more you put in, the more you get out. Some of the opportunities for members are being delivered by the Health Foundation (for example our Q Improvement Lab and site visits programme). We will be partnering with QI Connect to support the reach of this fantastic webinar programme. 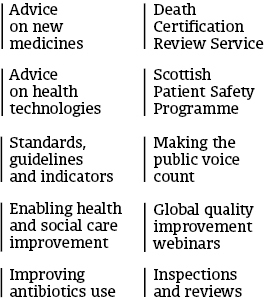 There are other activities which will be led by our partners Healthcare Improvement Scotland. Q members also self-organise, with a number of Special Interest Groups (SIGs) for example set up and run by members. We have lots more to share with you via our website. One of the most important things to emphasise is that Q is designed to support the work members are already doing in improvement and not for it to be an additional project. One of our members Mark Kelvin talks about the “invaluable safe space to share our concerns, challenges and successes”. We are nearing two years on from when we started co-designing and Q is really flourishing. There are currently 799 members and by the end of the year there will be several thousand. Working with Healthcare Improvement Scotland, the latest opportunity for those who are working or volunteering in Scotland to apply to join Q is open until 10 April. We ask people to reflect on their experience and expertise of improvement and how they can benefit and contribute to the community. Q is rich in the diversity of its members with patients, researchers, policy makers and senior leaders joining people working at the frontline of health, social care and other services. Already nearly 50 people from Scotland are members of Q. I’d encourage you to join us. For more details about how to join, check out the Q website at the link below.